Lafeber LED Collar Laifug Lavien Pet Products LINKS-IT® Litter Genie Liquid Vet LitterMaid Liver Aid by Liverite Lixit Products Loc8tor LTD Loving Pets LubriSyn Joint Supplement Life's Great Products, LLC. Genetics plays a significant role in your pet's health, and one disorder that afflicts certain dog breeds with reversible but predictable pains is hip dysplasia. Hip dysplasia is one of the most common skeletal diseases seen in dogs today, and it affects both genders of many dog breeds. The good news is that there is much that can be done to accommodate animals with this condition. Hip dysplasia is an inherited condition associated with the hip joint that can lead to the development of arthritis. Hip dysplasia is a genetically inherited condition that appears to affect a variety of breeds, including French Bulldogs, Mastiffs, and Pugs. The pain associated with hip dysplasia can vary in severity from mild discomfort to debilitating pain. In addition to genetics, weight and diet play an important role in the development of this condition. Proper weight is essential for preventing joint related issues related to hip dysplasia. Nutrition then plays two important parts in preventing the development of this condition, as it is essential both for controlling your dog’s weight and ensuring that your dog receives adequate nutrition to support healthy joints. If you suspect that your dog has hip dysplasia, the first step is a visit to the veterinarian. The veterinarian will begin with a standard physical exam which might include urinalysis, a blood chemical profile, an electrolyte panel, and a blood count. He may also look over your dog’s medical records and their family history to determine if your dog is genetically prone to developing this disease. 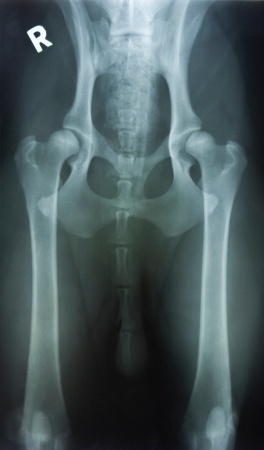 Current treatments for hip dysplasia vary from medical treatment with drugs to extensive surgical procedures such as triple pelvic osteotomy (TPO), femoral head ostectomy (FHO) and total hip replacement. TPO is a common procedure for younger dogs that have been diagnosed with hip dysplasia. Dogs experiencing pain and inflammation caused by hip dysplasia may also be prescribed medication to reduce inflammation. Popular medications prescribed to dysplastic dogs include NSAIDs like carprofen, which inhibits one of the enzymes responsible for inducing the inflammatory response. Another solution your vet may prescribe is Adequan for Dogs, which facilitates the production of cartilage and synovial fluid to promote the natural repair of joints. As previously stated, the prevention of hip dysplasia rests largely on the diet and exercise habits of your canine. A healthy dog needs to maintain a certain weight to prevent added stress on deteriorating joints. Low-impact exercise may also prove beneficial in protecting joints from damage. This may entail walking and swimming with your pet as opposed to running and jumping. We hope that this guide has provided a valuable resource for those hoping to treat or prevent hip dysplasia from afflicting their pets. 1 ASPCA “Hip Dysplasia” Pet Care. 2013. 2 PetMD “Hip Dysplasia in Dogs” Dog Conditions Retrieved Oct. 2013. 3Dr. Hayes, N. J. Triple Pelvic Osteotomy (TPO)” Whitney Veterinary Hospital “. 2005. 5“FAQ: Total Hip Replacement” The Ohio State University Veterinary Medical Center. Small Animal Surgery Services. 6 “Hip Dysplasia Statistics” Orthopedic Foundation for Animals. Retrieved May 18, 2015. Copyright 2001 - 2019 © EntirelyPets. All Rights Reserved.